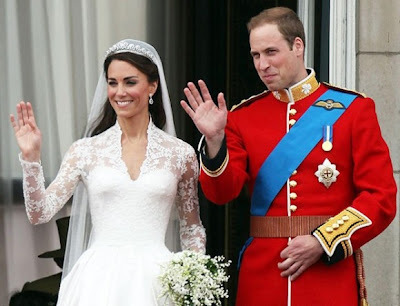 This week the whole world has been caught up in the Kate Middleton & Prince William's Royal Wedding! Of course all eyes were on Kate and her beautiful wedding dress! 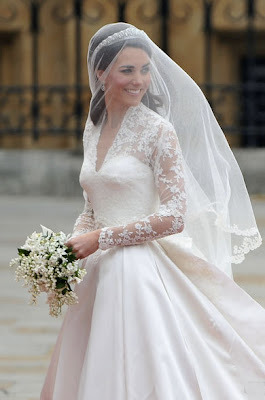 I thought Kate looked simply stunning in her £40,000 lace and silk made-to-measure Alexander McQueen gown designed by Sarah Burton. 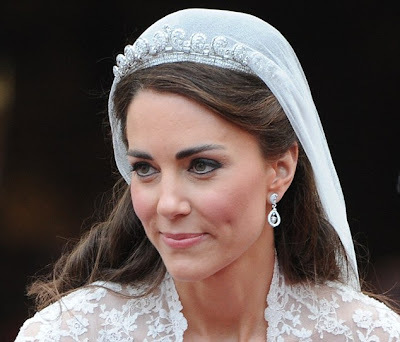 ﻿ Kate surprised everyone by insisting on doing her own wedding makeup as she believes ‘she knows her own face’ and that no makeup artist can make her look better than she can! She has been taking make up lessons from Arabella Preston, and rumour has it Kate has been noting make up tips from watching You Tube videos, I wonder if she also reads any beauty blogs?! Kate created a light smokey grey taupe eye with her her trademark strong black eyeliner under and above the eye, and used plenty of her favourite Lancome’s Hypnose Mascara to add length and volume to her lashes. Her choice of a rosy pink blush similar to her lipstick colour was stronger than normal but looked elegant and enhanced her glowing skin. The Duchess’ of Cambridge’s ‘half up, half down’ hair style was created by James Pyrce and her Manicure was done by Marina Sandoval from Jo Hansford, London using a customised mix of Bourjois Number 28 Rose Lounge and Essie Allure polishes. Question is would you do your own wedding make up or leave it to the experts? I am a makeup artist but I am leaving my makeup to another professional! I think I'm going to be too excited and nervous to do my own! Overall her makeup was good, except the blush was too dark - darker than her lips. And a lighter hand with the eyeliner underneath the eye would have been better. I thought she looked stunning and think when I get married I'll also do my own makeup. Perhaps a bit less blush though... although Kate could go out wearing a binbag and still look gorgeous unlike me, haha!